Preface Chapter 1. Theoretical and Experimental Studies on 19F NMR Shieldings in Mineral Glasses, Zeolites and Related Silsequioxanes by J.A. Tossell, University of Maryland, USA. Chapter 2. NOE Studies of Solvent-Solute Interactions by J.T. Gerig, University of California Santa Barbara, USA. Chapter 3. - DFT Computations of Transition Metal Chemical Shifts by Michael Buehl, Max Plank Institute, Muelheim an der Ruhr, Germany. Chapter 4. Solid-State NMR Studies of Collagen Structure and Dynamics in Isolated Fibrils and in Biological Tissues by Daniel Huster, Martin Luther University Halle-Wittemberg, Germany. Chapter 5. NMR Studies of Beverage by J. Kidric, National Institute of Chemistry, Ljubljana, Slovenia. Chapter 6. Contribution of NMR Spectroscopy to Flavour Release and Perception by L. Tavel, E. Guichard and C. Moreau, INRA, Dijon, France. Chapter 7. Polymer Blend Miscibility by Jeffrey L. White, Oklahoma State University, Stillwater, USA. 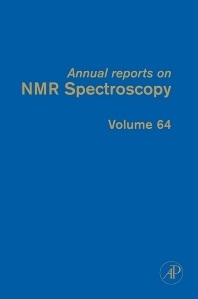 The great importance of NMR in many areas of scientific research is once again highlighted in this volume of Annual Reports on NMR Spectroscopy.